Just as attention demanding as the lyrics is the production by Alchemist, who has always been consistant. Surprisingly, I don't often hear him come up in conversation when on the subject of producers in hip-hop circles. Alchemist could very well be to hip-hop what Mitch Richmond was to the NBA in the mid 90's – underrated. However, on this particular track both artist help paint a portrait of anticipation; the climactic scene before the shoot out. With its crawling funky vibe, this particular scene happens to take place in a blaxploitation film. Make sure to look out for The Cure 2. 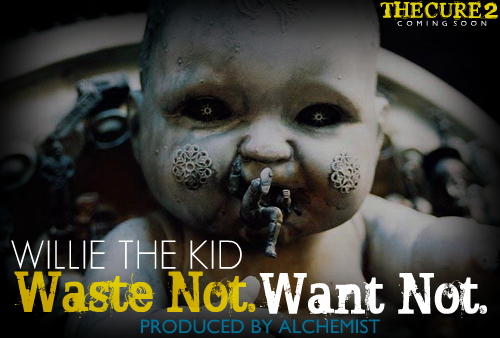 Willie The Kid & Alchemist – Waste Not. Want Not. MNDR and Killer Mike shoot to kill on "Lock & Load"
Action Bronson and Danny Brown are nothing but "Bad News"
Earl Sweatshirt releases short song titled "45"